Jon W. Davidson’s work day began at 6:30 a.m. California time on Wednesday, moments after President Donald Trump made the unexpected announcement on Twitter that he would ban transgender people from serving in the military. Across the country, attorneys and advocacy groups like Lambda are gearing up to challenge Trump’s decision in court, saying potential plaintiffs are already lining up to file suit. They argue it runs afoul of the Constitution’s Equal Protection and Due Process clauses, discriminates against a vulnerable group and lacks the ‘‘rational basis’’ necessary to be upheld in court. His decision was announced with such haste that the White House could not answer basic inquiries on about how it would be carried out. The only thing keeping them from the courthouse for now is the ambiguity of the announcement. The president has issued no executive order, no policy memo, no guidance, no rulemaking - just a string of tweets, in classic Trump fashion. At the first sign of a formal policy, Davidson and others are prepared to sue the government on behalf of current transgender service members and those seeking to enlist. 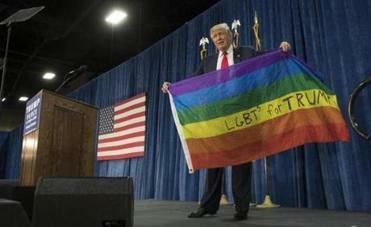 The LGBT military group OutServ-SLDN said it would join the effort ‘‘in a heartbeat,’’ along with the National Center for Lesbian Rights, which called the move a ‘‘bizarre assault on these dedicated service members.’’ The American Civil Liberties Union also threatened to file suit, calling on transgender services members to get in touch with the organization. John Culhane, a constitutional law professor at Delaware Law School, predicted the Trump administration ‘‘may soon learn that singling out a class of people for exclusion violates the constitutional guarantee of equal protection under the law.’’ In a commentary for Politico on Wednesday, Culhane noted that untold numbers of transgender soldiers came out and others enlisted as a result of the Obama administration policy that allowed them to serve openly. Discharging them, he wrote, would create problems of ‘‘reliance,’’ the legal principle of acting on another’s promise. Davidson, of Lambda, echoed her remarks, saying that while Trump had considerable powers as commander in chief, military policies are far from unreviewable in court. Davidson also argued that Trump’s reasons for enacting a ban on transgender people in the military were ‘‘demonstrably false’’ and would be incorporated in his group’s legal challenge. ‘‘Look, I think sometimes you have to make decisions, and once he made a decision, he didn’t feel it was necessary to hold that decision, and they’re going to work together with the Department of Defense to lawfully implement it,’’ Sanders said. She added that Trump had informed Defense Secretary Jim Mattis of his move on Tuesday. In the interest of fairness, it would be helpful to include more details here elucidating Trump’s decision, but such insights are hard to come by these days.